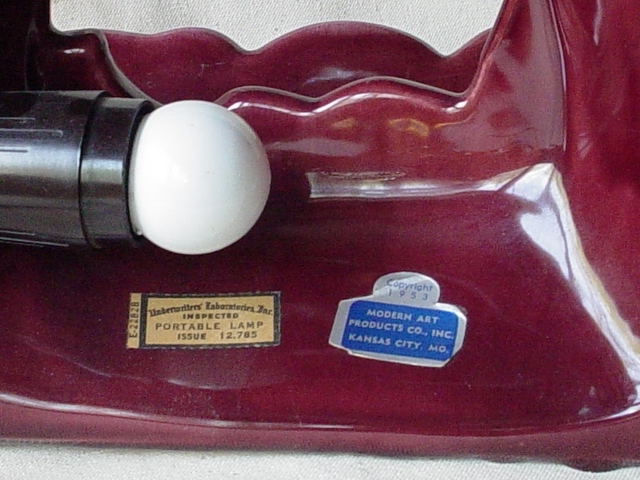 Nathan Jagoda was the founder of Modern Art Products Co., a lamp manufacturing business in Kansas City, Missouri. The company was originally located at 1229 Charlotte St., but later moved to a larger facility at 1530 Locust. 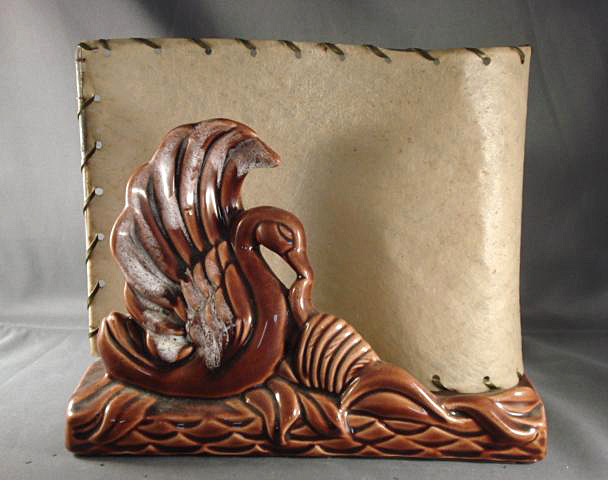 The company was quite progressive, and produced designs of great elegance and originality. 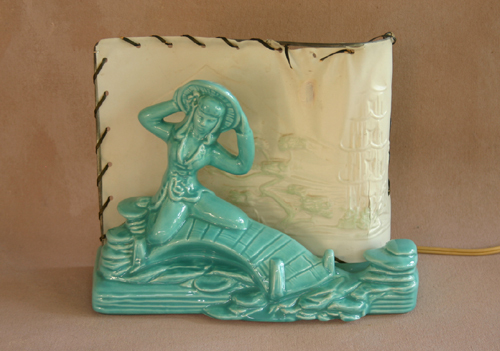 Nathan himself contributed greatly to product design, but one or more designers were also used for that purpose. 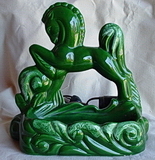 The designer/designers are unknown, but at least one piece is marked, Designed by P.H.G. 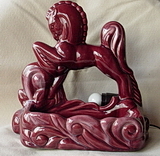 Many of their lamps seem to have been marketed under the trade name Tierra Royal. Company President Jacob Jagoda (Nathan's father) passed away in 1971. Unfortunately Modern Art's lamps can only be identified if the original foil label is present, making them little known today, even among the most avid of collectors. They are often attributed incorrectly to Royal Haeger, McCoy, etc. 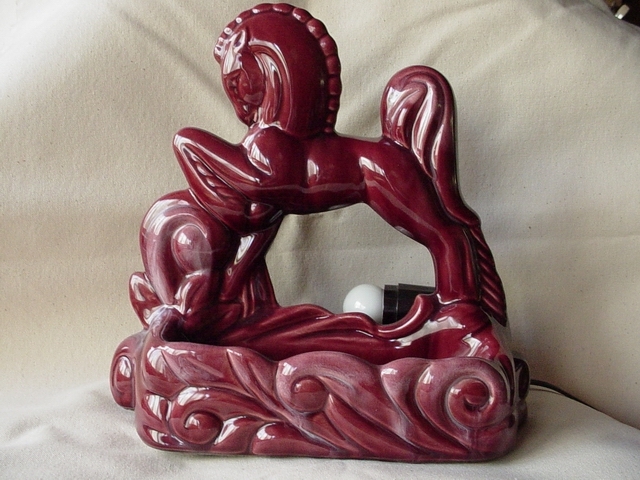 Not present on this example, this Modern Art lamp came with a fiberglass shade below the horses belly to diffuse the light. 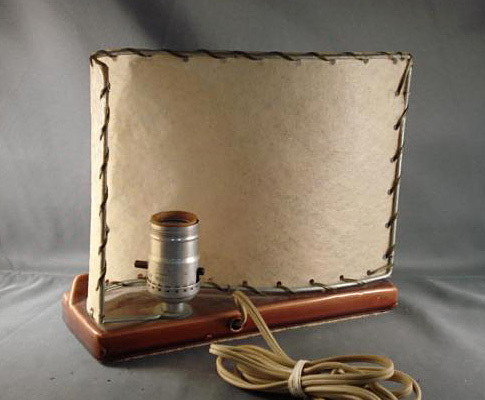 This beauty was my first TV lamp...the one that got me hooked! 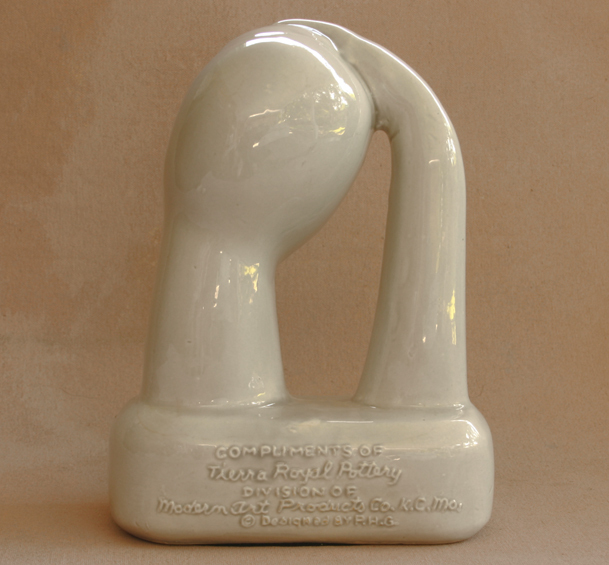 This back view shows the original label indicating a copyright date of 1953. Here's a close-up of the Modern Art Products Co. foil label. 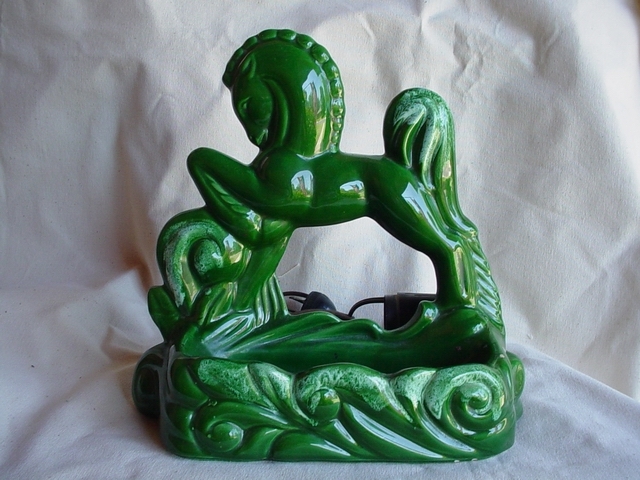 Same as above in green, another of several colors found on this particular TV lamp. 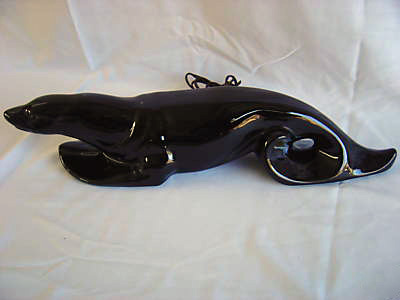 Looking like an aquatic version of the classic stalking panther TV lamp, this seal from Modern Art Products is extremely rare. 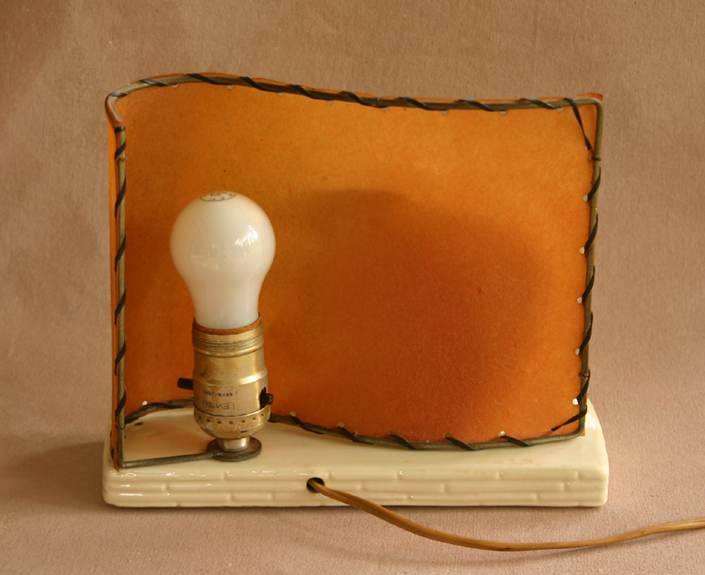 How many pirate TV lamps were designed? I think this one from Modern Art Products is it! 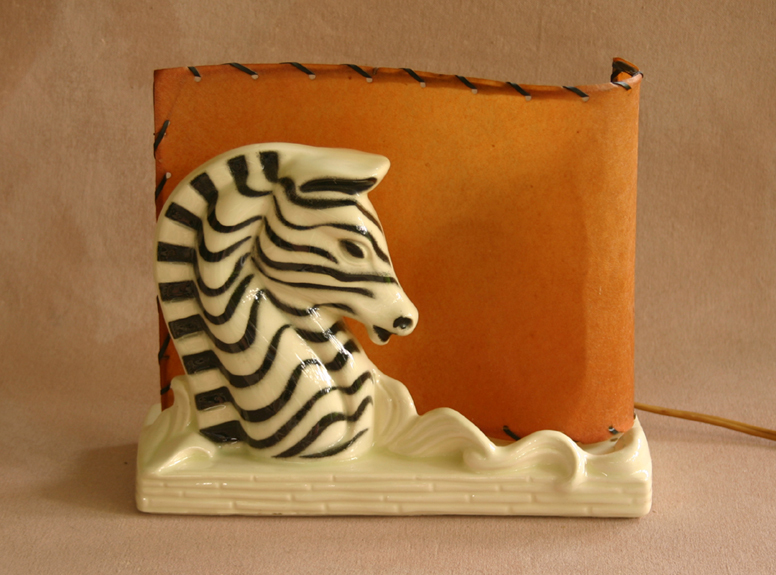 I was a little surprised to discover that this zebra lamp was from Modern Art Products, as it's so different from their horse TV lamp. Just the thing for the big-game hunters trophy room! Back view of Modern Art's zebra. 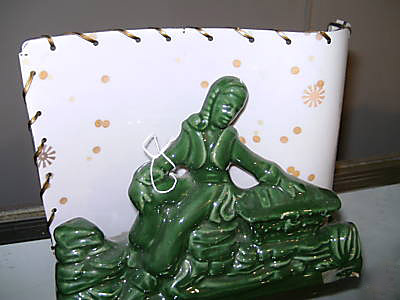 This oriental scene by Modern Art Products looks like a page from Haeger Potteries or Lane & Co. 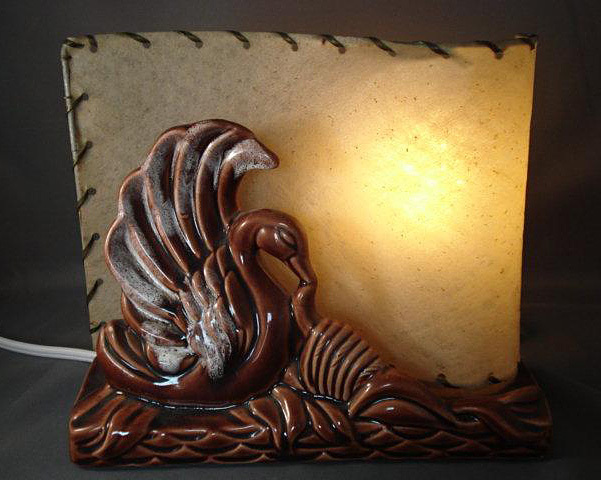 This swan from Modern Art Products can be found in several colors. 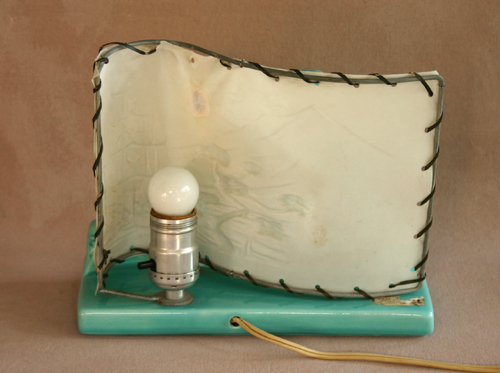 The fiberglass shades on these lamps are used to great effect. 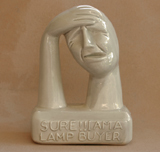 It can't be said that the folks at Modern Art Products didn't have a sense of humor! 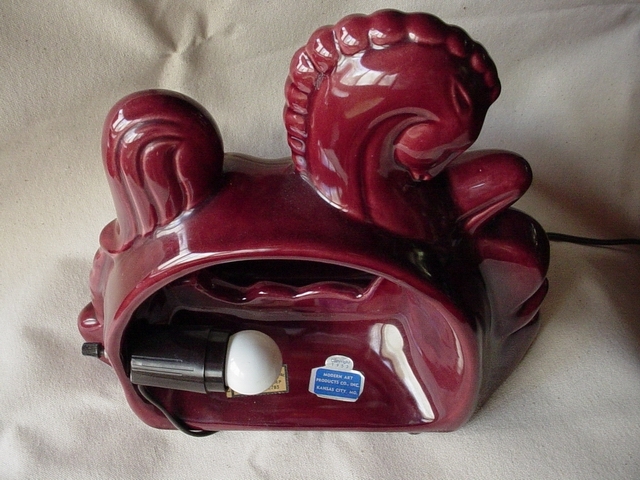 Not a lamp, this is instead an extremely rare promotional figurine. It must have been a hit at the trade shows. 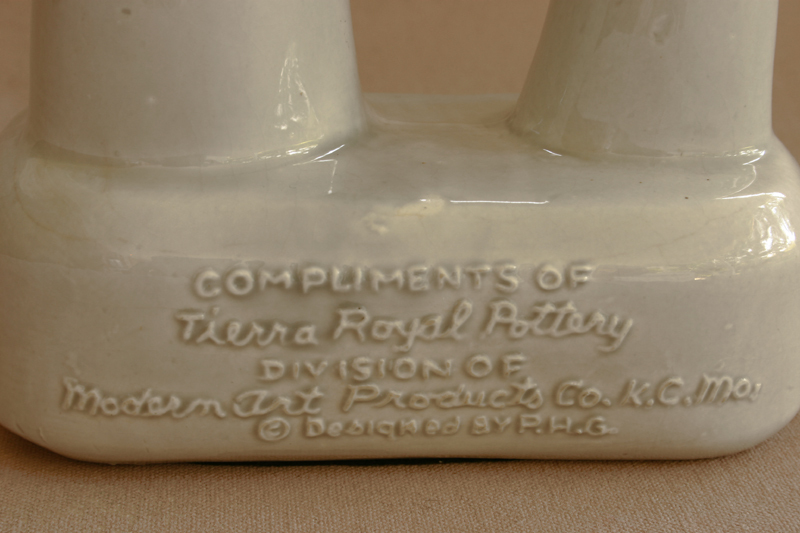 The back reads, Compliments of Tierra Royal Pottery, Division of Modern Art Products Co., K.C. MO. © Designed by P.H.G.